Silicon-On-Insulator (SOI) Technology: Manufacture and Applications covers SOI transistors and circuits, manufacture, and reliability. The book also looks at applications such as memory, power devices, and photonics. The book is divided into two parts; part one covers SOI materials and manufacture, while part two covers SOI devices and applications. The book begins with chapters that introduce techniques for manufacturing SOI wafer technology, the electrical properties of advanced SOI materials, and modeling short-channel SOI semiconductor transistors. Both partially depleted and fully depleted SOI technologies are considered. Chapters 6 and 7 concern junctionless and fin-on-oxide field effect transistors. The challenges of variability and electrostatic discharge in CMOS devices are also addressed. Part two covers recent and established technologies. These include SOI transistors for radio frequency applications, SOI CMOS circuits for ultralow-power applications, and improving device performance by using 3D integration of SOI integrated circuits. Finally, chapters 13 and 14 consider SOI technology for photonic integrated circuits and for micro-electromechanical systems and nano-electromechanical sensors. 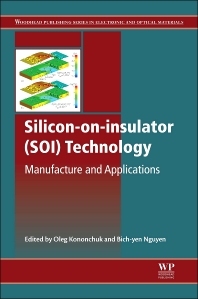 The extensive coverage provided by Silicon-On-Insulator (SOI) Technology makes the book a central resource for those working in the semiconductor industry, for circuit design engineers, and for academics. It is also important for electrical engineers in the automotive and consumer electronics sectors. Senior Fellow at Soitec, USA.